Fast, efficient and trouble-free. Change the way you handle payroll, so you can get back to doing what you enjoy best — running your business. As your payroll partner, we work hand-in-hand with you to implement a payroll solution that meets your unique needs. Payroll laws are constantly in flux — staying compliant can be a challenge. With our team on the job, you can leave those worries to us. 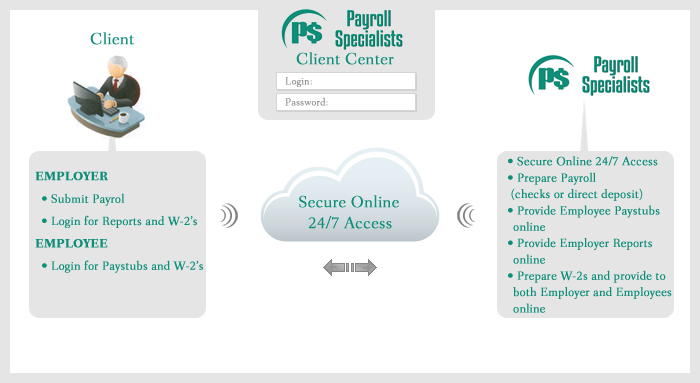 We will assign a dedicated payroll expert to work with you to take care of all your payroll needs. As technology leaders, we offer this service electronically, saving you time, money and reducing costly mistakes. Simply fax or upload your payroll information via a secure portal and our experts will take care of the rest. As your payroll partner, we will address all of your needs, including check processing and printing, direct deposit, W-2 processing, filing up-to-date quarterly and annual payroll taxes and reporting. Your employees will enjoy secure online access to their paycheck stub information and W2’s—saving you hours in distribution time.